Turn a freezer staple into one delicious and easy side dish with this recipe for Oven Roasted Green Beans! While I love them fresh, frozen green beans can be quite good. I’d never really thought of roasting them until recently though. I saw online that other people had tried it and decided to give it a try myself. I wasn’t expecting that they would be so tasty, but they actually are really good! Who knew roasting frozen green beans could make them taste so much better? While you can cook them according to package directions, I prefer the flavor and texture of roasted green beans. Preheat oven to 425°F. 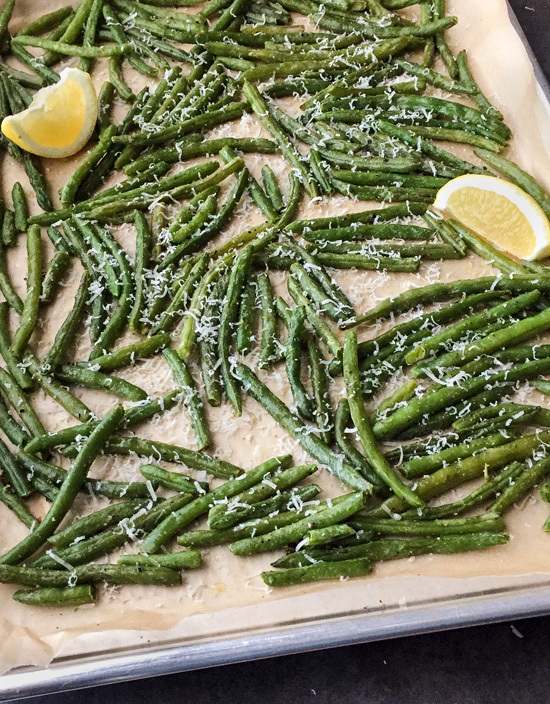 In a large bowl, toss the green beans with the olive oil, garlic powder, salt and pepper. Spread out evenly onto a parchment paper-lined baking sheet. Place into oven and roast for thirty minutes, stirring about halfway through the roasting time. Remove from oven, sprinkle shredded cheese over the top and squeeze fresh lemon juice over the beans. Serve immediately. I sprinkled some freshly shredded Parmigiano-Reggiano cheese over the top of mine as soon as they came out of the oven. I also squeezed a little fresh lemon juice over the beans. This is totally optional, but I like the tiny bit of acidity it adds. You could make this recipe with fresh green beans as well. The cook time would just be shorter. Either way, these Oven Roasted Green Beans make one yummy side dish! 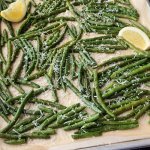 Turn a freezer staple into one delicious and easy side dish with this Oven Roasted Green Beans with Parmesan recipe! Fresh green beans can be used instead, but cook time would be reduced. By Tempie at October 23, 2018 .